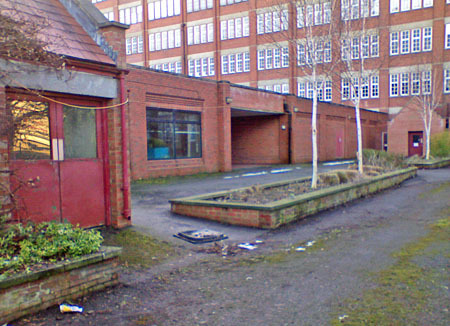 A little local detail, the tidied frontage of the Rowntree factory building on Haxby Road. Compare with earlier photos. 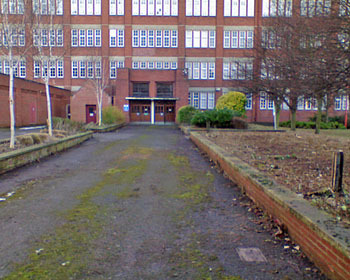 The local press included letters from members of the public concerned about the overgrown garden areas of this building, now empty and awaiting a new use. Nestlé are on the adjacent site busy making KitKats, but did take note, and have sent in a team of gardeners to cut back the burgeoning buddleia and rampant brambles. One of the comments on the press’s website highlighted the imminent disturbance of all the wildlife this overgrown garden will have been supporting. That was my first thought too. I rather like the wildlife-friendly natural exuberance, the way nature takes over these empty ‘brownfield’ sites. But clearly here it was seen as neglect, not caring, by people who used to work here, and they clearly felt hurt by that. Once Nestlé decided to act I’m glad that they timed it right and that the work was carried out before bird nesting season begins. Something we should all think about, of course, if we’re about to prune away a place where a blameless bird may be sitting on a nest. Fewer places left for them now, as we fill more gaps with buildings. Not particularly obvious before, but visible now the area has been cleared, this modern extension at the back of the Rowntree Memorial Library. I think this must have included at one time the entrance to the tunnel, previously mentioned, which went under the road from the factory to the dining block. Someone out there will no doubt be able to confirm.